When you think of pill boxes, you might be envisioning your grandmothers little silver pill box, or a 7 day pill organizer, or any number of pill reminder boxes or vitamin pill boxes. 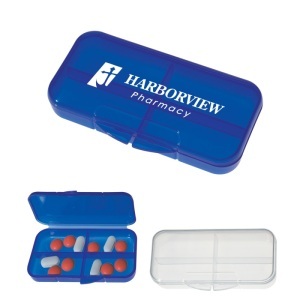 There are pill boxes that have one compartment to many compartments. Help take the medication on time. Save money by allowing you to take the medication properly. Help feel better through taking medication properly. Help those using your promotional pill box to be more independent. All of these Promotional Pill Boxes meet FDA requirements. Keep vitamins and medications organized in this oval pill container. It has 3 separate compartments to keep pills separated and a large imprint area for your custom printed message. SET UP CHARGE: $50.00 on new orders; $25.00 on re-orders. Your nursing home will get a great response from its residents when you have these convenient custom Rectangular Shape Pill Boxes imprinted with your facility's name. Choose from the color options for your personal favorite. Recipients can fill the plastic pill box with medicine needed for four days at a time. 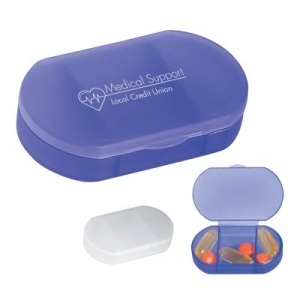 This rectangular shaped pill box has 4 separate compartments and is a great item at tradeshows, health fairs and more! It's a great give-away for the health care industry! 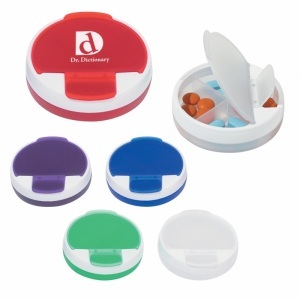 Round Pill Holders are great promotions for Hospitals and Clinics. Choose from the color options of frosted clear, green, purple, red or blue with white trim. This pill holder features a rotating top with large and small snap lids. This Silicone Pill Case has one large compartment. The silicone piece pops out to fill and back in to seal. Convenient Pill Holder to carry in purse or pocket.